Extraterrestrials examining external x-rays of a xylophone. An X-ray machine lets doctors take pictures of the bones inside your body. 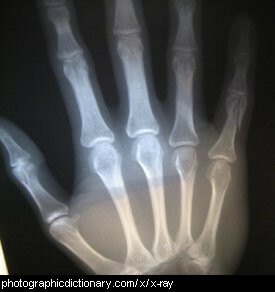 X-rays are a special kind of light which go through all of your body except your bones and other hard parts of your body, so the bones show up as white on the X-ray and the muscle in between shows black. Someone is xenophobic if they have an irrational fear of people who are different to them, such as strangers or foreigners. 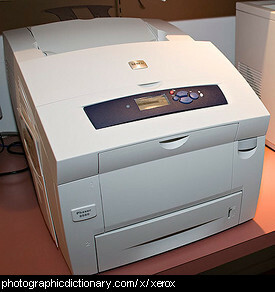 Xerox is a company who make photocopiers and printers, among other things. Their photocopiers were so widespread at one stage that the word Xerox was used to mean any photocopier, or any photocopied piece of paper. 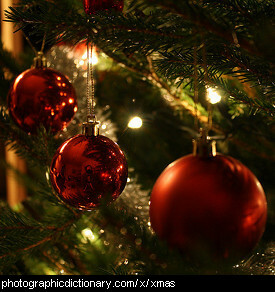 Xmas is an abbreviated form of Christmas. A xylophone is a kind of musical instrument. You make music by hitting the different-sized keys with small hammers to play a tune. The keys on xylophones are typically made out of wood, although some modern versions are made from plastic or fibreglass. Very early xylophones had keys made from gourds. 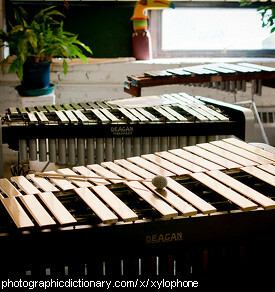 Xylophones are very similar to glockenspiels and vibraphones. Glockenspiels are made from metal and have a higher pitch, while a vibraphone is also made of metal but is a more modern instrument and has a sustain pedal. The instrument in the picture is actually a vibraphone. Most people call all of these similar instruments xylophones. The most popular image of a "xylophone" is the children's six or eight key version with brightly colored metal keys commonly seen in toy stores.